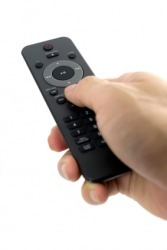 A remote is used to activate the DVD player. The definition of activate means to start something. An example of activate is when the “play” button is pushed on the DVD player and it starts to play the disk. "activate." YourDictionary, n.d. Web. 19 April 2019. <https://www.yourdictionary.com/ACTIVATE>. To set in motion; make active or more active. To organize or create (a military unit, for example): activate the National Guard. To treat (sewage) with aeration and bacteria to aid decomposition. Chemistry To accelerate a reaction in, as by heat. Physics To make (a substance) radioactive. Biology To convert (a molecule or cell) into a form that carries out a specific action: activate an enzyme; activate B cells. To put into action, to put to work. (2) To interact with an activation server at the time copy-protected software is installed. The install program generates a code that is sent to the activation server, which responds with an authorization code that allows the software to operate. Without the authorization code, the software generally times out. Biology To convert a molecule or cell into a form that carries out a specific action: activate an enzyme; activate B cells. It's somewhat unclear about how it works but studies show that it may activate the nicotine receptors in the brain - which creates a feeling of having smoked even though you haven't and blocks real nicotine from attaching to the receptors. Color is certainly important and is used in conjunction with direction and elements, but it should never be used in an effort to activate an element.To believe a bedroom in the north must be painted blue is rigid thinking and incorrect. Whereas most cell phone providers do a credit check and otherwise verify the identity of customers who buy mobile phones with a contract, a prepaid customer can simply buy a phone off the shelf and activate it on her own. For example, uterine tissue can enter the mother's circulation during prolonged labor, introducing foreign proteins into the blood, or the venom of some exotic snakes can activate one of the clotting factors. While you definitely need to have a credit card in order to activate your membership through the video game console, it is possible to get a subscription without a credit card through other means.